Virtually every Tech fan has at least one friend who’s staunchly anti-triple option, and said friend is generally quite vocal about their cause. You’ve heard it all before: for years, Paul Johnson was able to prey upon a relatively weak ACC, racking up free wins and numerous bowl appearances with a gimmick offense that just cannot keep up given the level of talent in today’s ACC play. Granted, there’s something to be said for building an offensive system around the players as opposed to forcing athletes to play out of their talent zone. And yes, Clemson did win a national title two seasons ago. But just in case anyone needed a reminder that this conference is still top-to-bottom weaker than any other Power Five conference in CFB, just know that not only was Tech one of two ACC teams to take it on the chin from an American Athletic Conference program this week, the Jackets’ loss wasn’t even on the same order of magnitude of humiliation as UNC’s 41-19 rout at the hands of East Carolina University. One of the few teams on this list that has any shot of ending this season ranked in the AP Top 25, No. 13 Virginia Tech built upon its Week 1 lockdown of Taggart’s new FSU squad with a 62-17 dismantling of William & Mary. Since ECU cancelled their game with VT this Saturday over concerns about Hurricane Florence, the Hokies will have an extra week to prepare for the illustrious Old Dominion on their road to 3-0. In all seriousness, QB Josh Jackson looks like the real deal this year with a significantly improved completion rate to go with better than ten yards per attempt and no interceptions. The loss of Tremaine and Terrell Edmunds to the NFL Draft hasn’t hurt yet, and with Duke losing Daniel Jones for an indefinite amount of time with a clavicle injury, the Hokies look to run away with the conference. Being the second best team in the 2018 ACC Coastal is kind of like being the second tallest person in Snow White’s woodland cottage: sure, the difference is technically nonzero, but the margin of separation between you and the next six guys is virtually negligible. Given how No. 21 Miami closed out their 2017 with losses to Clemson, Pitt, and Wisconsin — not to mention near losses to Tech and UNC — I am still not convinced that Miami is actually good at football. Fortunately for the ‘Canes the early schedule is not tough, so after a 77-0 Week 2 rout of Savannah State, Miami will likely cruise to 4-1 going into Week 6 vs. FSU with wins over Toledo, FIU, and North Carolina. As much as I may have been drinking the Kool-Aid on Duke through the first two weeks, losing the quarterback hurts significantly. Cornerback Mark Gilbert’s season-ending injury does little to ease the pain, as his veteran presence contributed in both the quantifiable, his team-leading picks in 2017, and the intangible, his numerous pre-play formation shift calls to his companions in the secondary. Fortunately, backup passer Quentin Harris is more than capable of running the show until Jones’ ultimate return, and with a pair of workhorse RBs to complement what was once an electric pass game, while Duke’s offense may become slightly more one-dimensional moving forward, they’re still in a position to make a late-season push for the division. Yes, losing Benson is horrible. Yes, giving up back to back kickoff return touchdowns is less than ideal. Yes, the defense still has some things that need to be fixed — tackling — and a few weaknesses on the edge — tackling — that should be tackled in the next few weeks. But when all is said and done, Tech put up over 600 yards of offense against USF. Searcy, despite his costly fumble, is a capable speedster that has been keeping defenses honest and opening up the dive for whoever ends up as B-Back No. 1 next week. Backup QB Tobias Oliver showed flashes of brilliance, and if TaQuon Marshall has any more weak first quarters moving forward, is at the very least a known quantity to be used in emergency situations. A bowl game is still not out of the question! For the record: the No. 11 Penn State that manhandled Pitt to the tune of 51-6 is in fact the same Penn State that got taken to overtime by App State in Week 1. 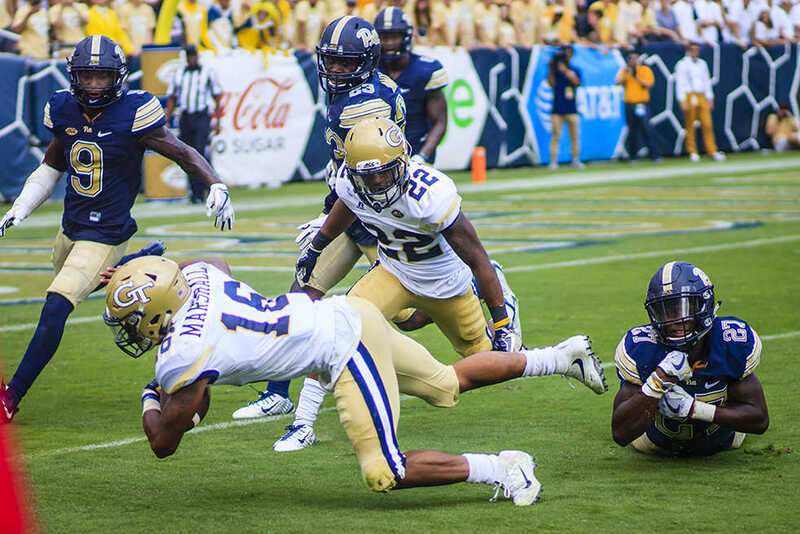 Pitt’s defense looked porous both up front and in the secondary, 44 unanswered points is never a good look, and if there’s one special teams unit in the ACC that could challenge Tech’s in terms of totally botching it at all the wrong moments, the placeholder who bobbled the extra point snap after the lone touchdown and the game’s single field goal attempt certainly puts Pitt into contention. This week’s matchup between the Jackets and Panthers will settle once and for all which team the top-tier Coastal programs should use as a baseline for “bare minimum” teams to have better records than as the 2018 season progresses. Quarterback Bryce Perkins’ 106 passing and 123 rushing yards against Indiana in Week 2 set a school record for first back-to-back 100 yard rushing performances to start off the season from a QB. Unfortunately, the Cavaliers took a loss in the matchup between universities best known for their basketball programs. It is hard to see the Cavs making much noise as the season goes on. Losing by a touchdown to Cal was not good for the Tar Heels, but it was not indefensible either; both are Power Five programs, and the final margin was only a touchdown. Losing to the East Carolina Pirates 41-19, including a 20-0 ECU second half, might mark this Tar Heels season as over before it really begins. Basketball season is not far.